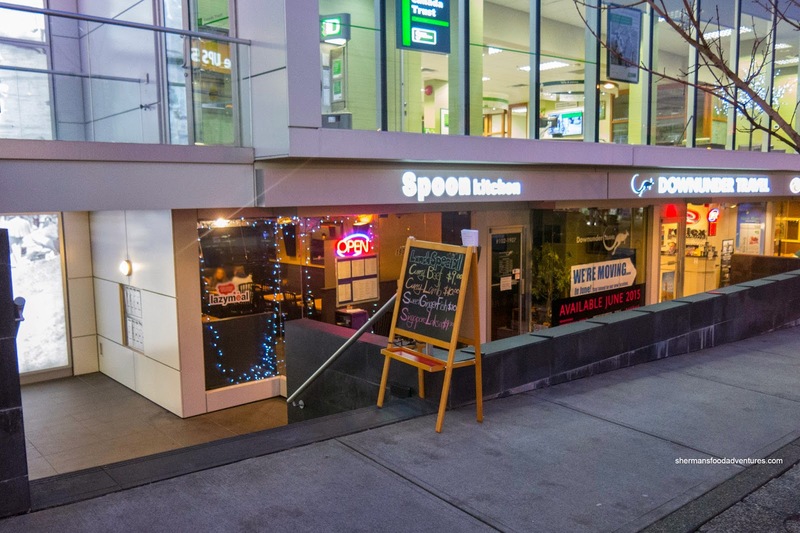 Fresh off a couple of fantastic meals at Manis Pan-Asian Eatery, we were right back at it with another Malaysian meal at Spoon Kitchen. Ned Flanders, in addition to Choobee, JoJo and a bunch of their friends were all present to help tackle the menu. Armed with a coupon that allowed us to sample 8 courses, it enabled us to go nuts with substantial additions to our meal. This was a nice revelation for Choobee as she can give Mijune a run-for-her-money in terms of ordering way too many dishes. 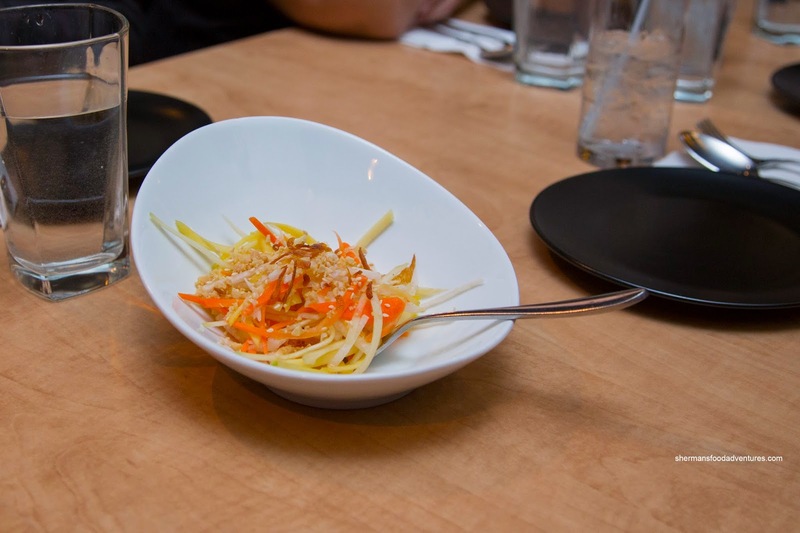 shredded mango, cucumber, carrots, shallots and jicama in a lime dressing topped by crushed peanuts and sesame seeds. This was a light salad that had enough crunch for texture, yet was pretty ordinary as it lacked any punch. 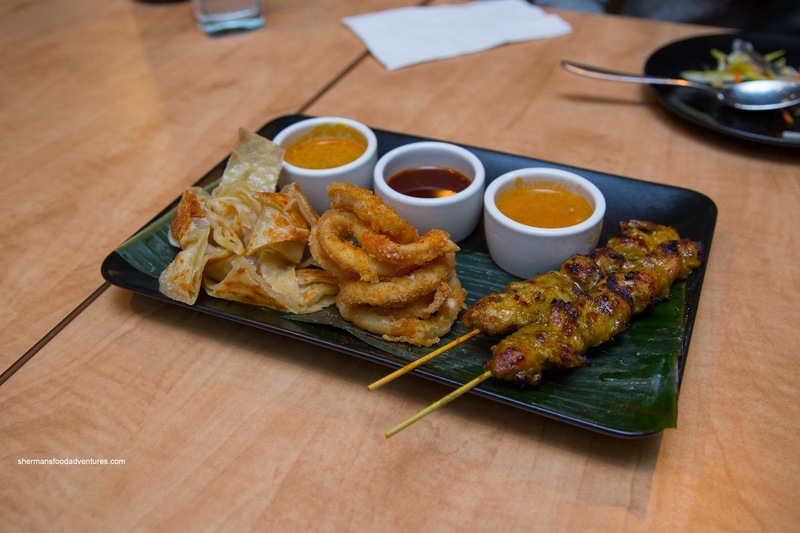 Next, we had a plate that consisted of Roti Canai, Calamari and Chicken Satay. Really crunchy on the outside, the roti was a little dry and chewy. With that being said, it was decent. The accompanying dip was mild and slightly creamy from the coconut milk. We thought the calamari was pretty good with tender rings that still retained an appealing chew. Lightly breaded, it was crispy and not overly greasy. Exhibiting a sweet zing, the chili dipping sauce had loads of impact. Featuring succulent dark meat, the chicken satay was well-seasoned and nicely charred. The peanut dip was sweet, yet ultimately mild-tasting. 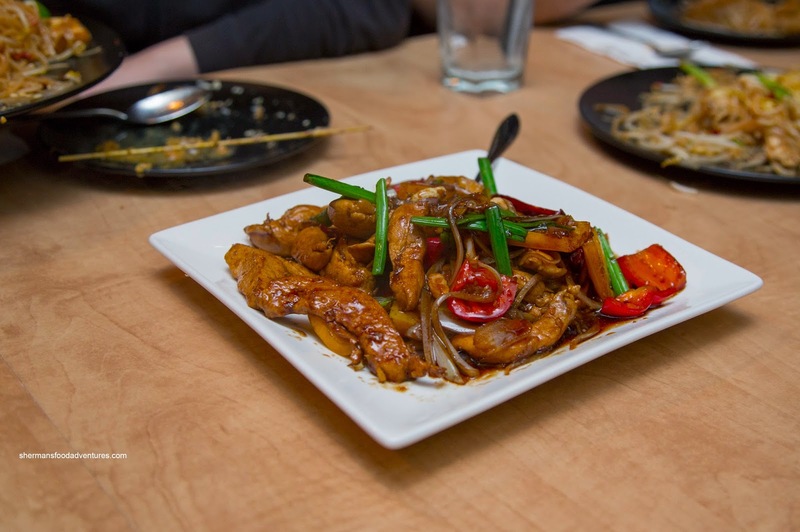 Onto some bigger items, we had Caramelized Ginger Fish stir-fried with black sweet soy sauce, caramelized ginger, garlic, shallots and rice wine. 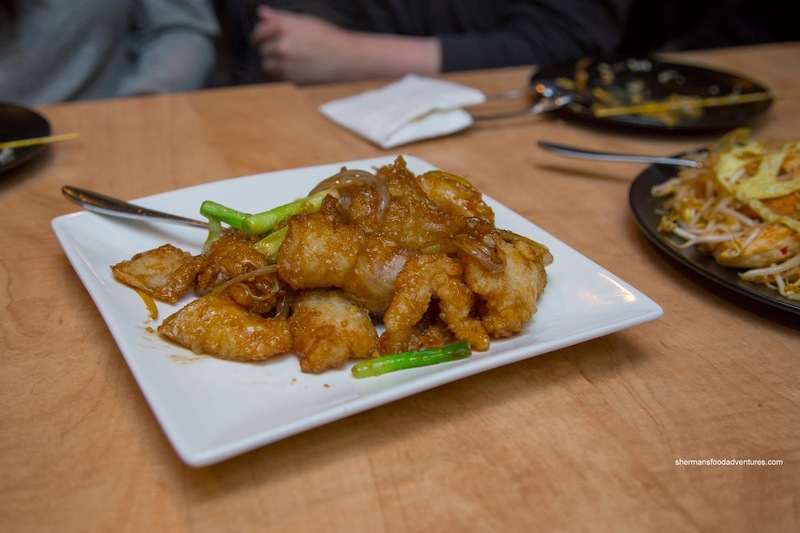 Although the batter started to take on a spongy texture due to the moisture, the fish itself was moist and flaky. We thought the flavours were a touch too sweet, but the ginger and garlic really came through. 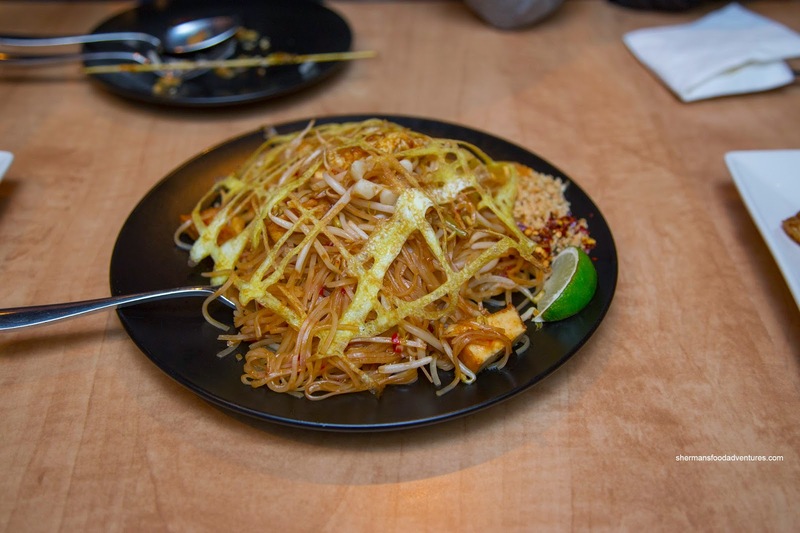 Ned Flanders was curious with the Pad Thai and it did arrive with an interesting egg lattice on top. Despite the menu description about the use of tamarind, there was an abundance of palm sugar that practically negated the tang. However, the noodles were wok-fried expertly where it was chewy and caramelized. The chili flakes were a nice addition as it provided a kick. 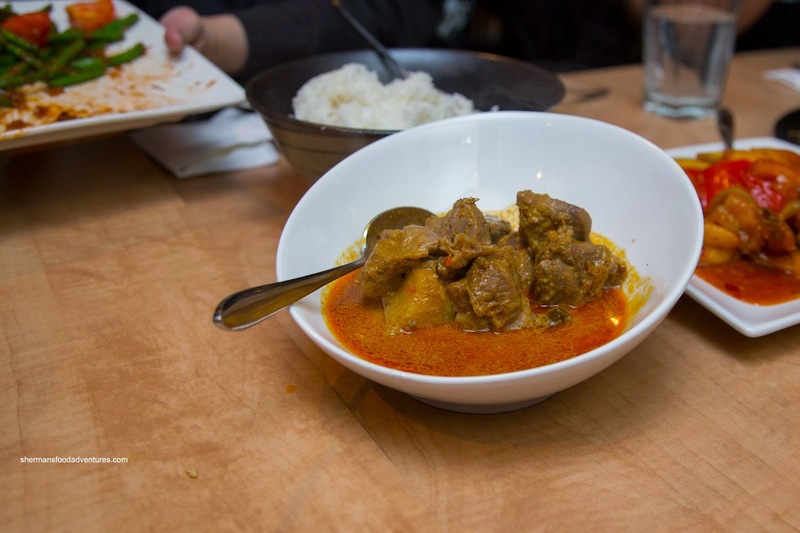 Moving along, we dug into the Beef Rendang consisting of boneless tender beef cooked with a paste of ground onion, lemongrass and chili. Despite its description on the menu, I noticed the ginger and coconut milk more than the other ingredients. Unlike other versions I've had, this one was more sweet and had a slight star anise hit. I didn't mind the dish, but it was a bit too mild-tasting. As for the beef, it was pretty good being moist in big chunks. 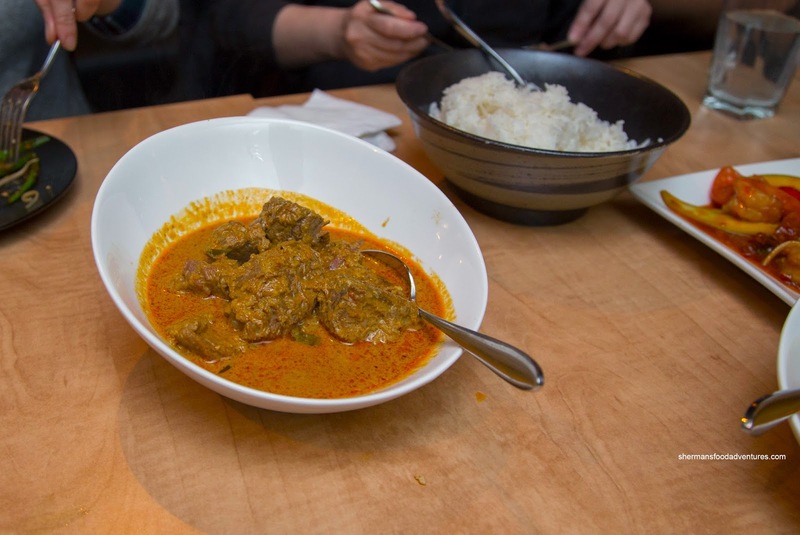 We also had the Lamb Curry made with slow cooked lamb in red curry sauteed in coconut milk. Much like the previous dish, the lamb was in big chunks and nicely moist and tender. It was only slightly spicy while being sweet. Continuing on with our feast, the Kung Pao Chicken made with boneless chicken breast, peanuts, dried chili, soy sauce, chili and black rice vinegar arrived next. As much as this was a more authentic version than the typical North American dish, it was pretty sweet with little heat and tang. Although there was a good amount of large chicken strips, they were pretty dry. Seemingly excessive on the sugar, the next dish was also very sweet being the Mango Chili Prawns with basil. 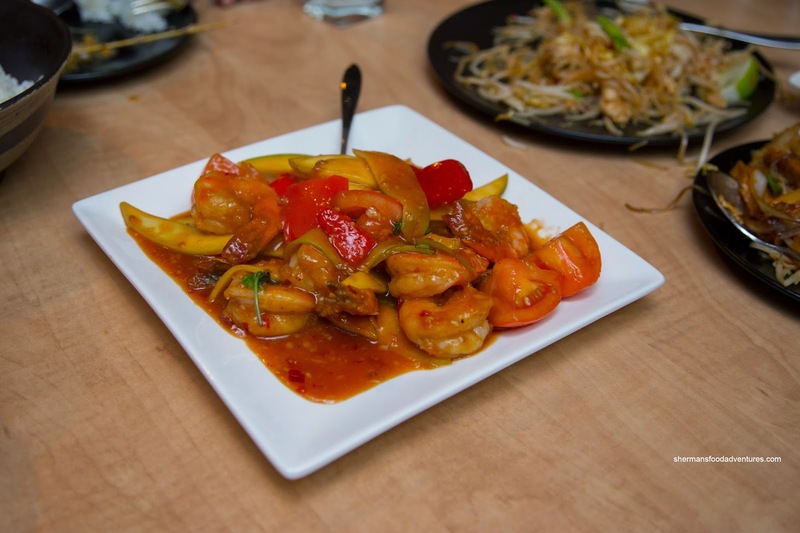 With a considerable amount of sweet chili sauce, the dish took on that flavour (which was too sweet in our opinion since there was mango already). As for the prawns, they were large and meaty. 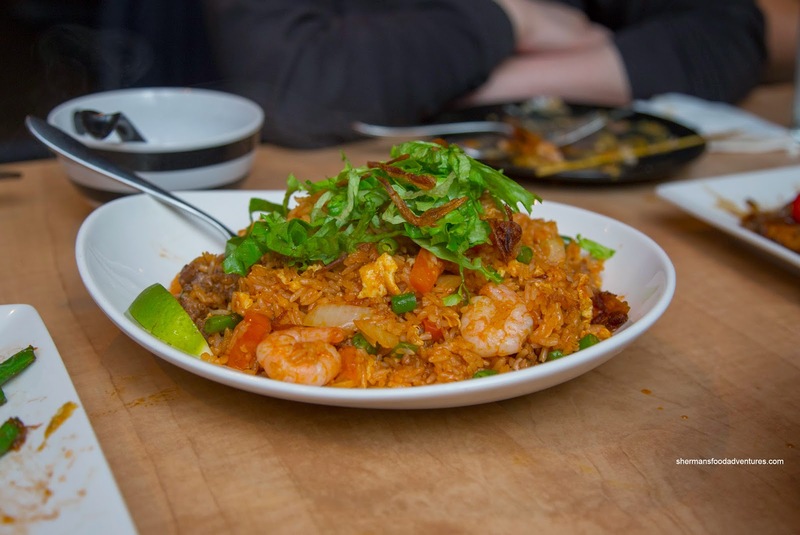 Completely different than the version we had at Manis, the Nasi Goreng was yes, you guessed it, sweet. There was some tang from the tarmarind, but it didn't seem like there was any Kachup Manis or very little of it. Rather, it appeared to be doused in sweet chili sauce. There was good wok heat though and caramelization of flavours. As evidenced in the picture, there was no absence of ingredients. 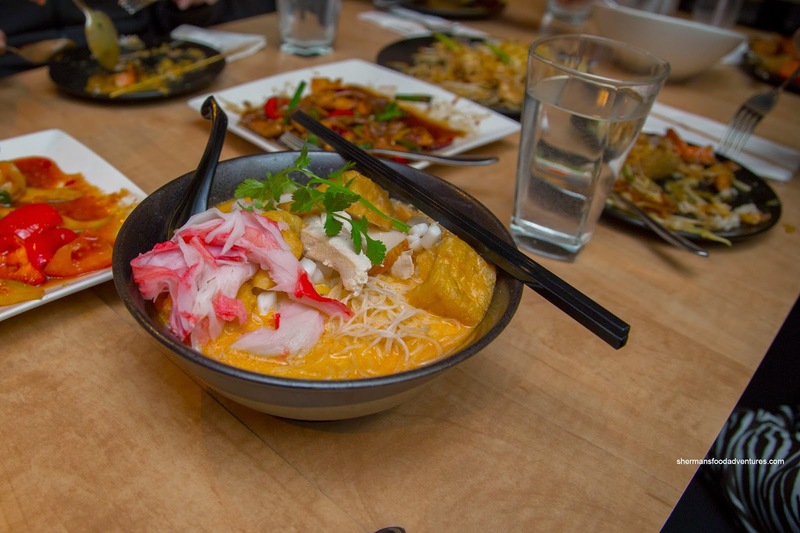 Being influenced from our meal at Manis, we tried the Singaporean Laksa. We really didn't like this version as the broth was like drinking pure coconut milk with only a minor spattering of spice. It was far too creamy and one note. We also didn't like the addition of the salty imitation crab. 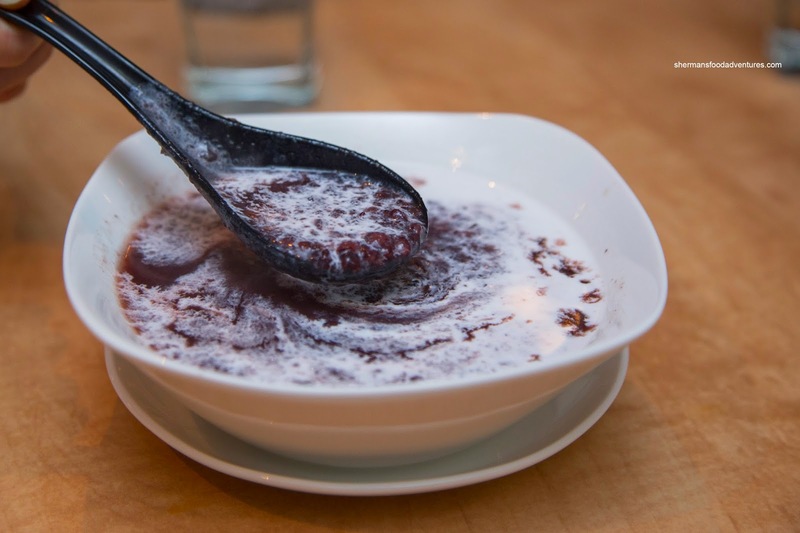 For dessert, we were served a soupy type of Black Rice Pudding topped with coconut milk. It wasn't overly sweet and the good amount of coconut milk added a nice aroma. I would've liked to see a thicker consistency though. At the end of the meal, Ned Flanders reiterated that it was unfortunate that we ate at Spoon Kitchen so soon after we had just dined at Manis. With such heightened expectations as a result, nothing less than amazing would've impressed us. Hence, our meal at Spoon was serviceable, but hardly memorable.